The contest is open to all artists worldwide, cartoonists, caricaturists, painters, illustrators, etc. Deadline for entries is 9 April 2018. The works must be original. The authors should have full copyright and be responsible for all the legal responsibilities related to the productions copyright. 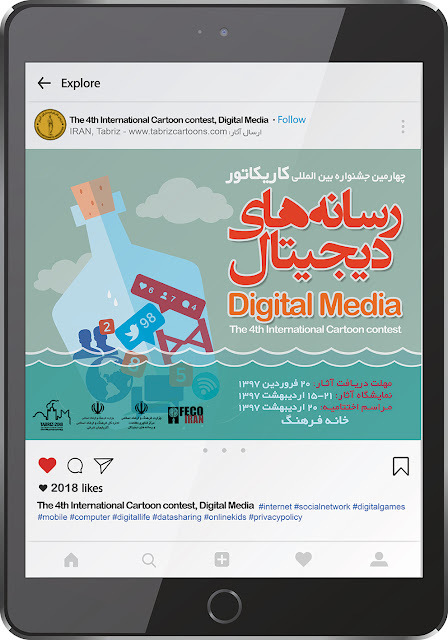 Cartoons accepted for exhibition and prize-awarded cartoons might be published for any kind of publications in press or advertising concerning the contest. Some of accepted works will be printed in a brochure, on posters, in the world press or other printed matter for the purpose of publicizing the exhibition. In these cases any fee for the use of works will not be paid. 0 Response to "The 4th International Cartoon contest, Digital Media, Iran 2018"